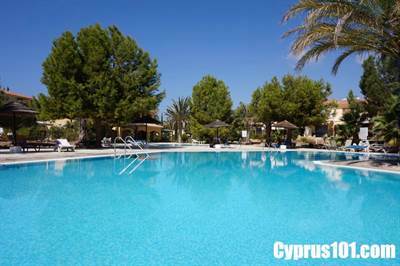 This delightful ground floor apartment is located on a beautifully maintained, exclusive holiday resort in the Tomb of the Kings area of Kato Paphos. Situated within walking distance to local amenities, the coast and local bus route, the location is superb and the property is highly suitable as a holiday home and/or rental investment. The accommodation features a light and spacious open plan living room with comfortable lounge, dining area and fitted kitchen. The fully equipped kitchen with fresh white units is nicely separated from the dining space by a wood topped breakfast bar. Appliances include built-in oven, electric hob, extractor fan, fridge/freezer, washing machine and microwave. A decorative archway off the living room leads through to an inner hallway with built-in linen cupboard. To the right is a large double bedroom with fitted wardrobes and easy direct access to the outdoor leisure space and to the left, a modern shower room with impressive rain spa shower head. Wall to wall patio doors in the lounge open to a courtyard garden with paved terrace perfect for alfresco dining and relaxing. Hedges and mature shrubs offer privacy as well as fantastic colour and fragrance. A pathway from here meanders through the beautifully landscaped communal gardens to two crystal clear mosaic tiled swimming pools with sunbathing terraces, children’s paddling pool and shower/toilet/changing facilities. With full title deeds this property certainly has lots to offer – superb location, quality furnished accommodation, secluded outdoor leisure space and amazing communal facilities.